For literature this week, Faith & I gave Frog & Toad Are Friends a try for making another lapbook. It was nice to try a combo lesson for her & Ben, though I'm not sure how often that will work. They did enjoy both making frog lapbooks! Like the last one we did, the book was a little under her reading level, which meant she understood it well enough to take several leaps for designing her lapbook. I've noticed that she can stretch more if the book itself is easier, whereas she gets discouraged if the book is more complicated. We did a 3 panel lapbook again. I'm intrigued by the larger ones, but we also have other curriculums we use, so the 3 panel suits our purposes. In the right panel are 5 mini accordian books, one for each chapter of Frog & Toad Are Friends. Faith's job was to figure out a way to retell (summarize) the chapter in 4 simple sentences, so that someone would get the gist of the story. It was a bit arduous! She can retell a story beautifully, but simplifying it to 4 sentences was a fun challenge. She also illustrated each story with very cute frogs & toads. In the left panel, there is a graduated book called "How are Frog & Toad friends?" Each page is for a different chapter where she had to explain how they showed they are friends ie) in The Button, Frog helps Toad look for his missing button, Toad gives a jacket to Frog to thank him. There is also an envelope where we learned about writing a friendly letter. Faith already writes to her penpal Meghan and informed me that she knows how to write a letter. ;o) However, we went over the actual format of the letter (addresses, salutation, closing, all the stuff she doesn't worry about). After putting the book together, we discovered there was an empty space. That space is now occupied by two Sizzix frogs, one brown like Toad & one green like Frog, that list adjectives to describe each character. The middle panel has some of our Science work--a life cycle of a frog and a Venn diagram comparing frogs & toads. 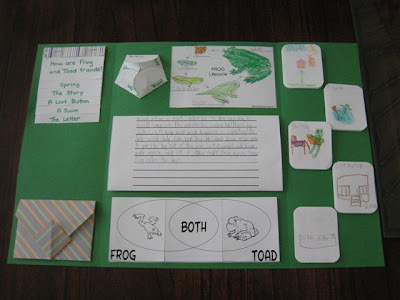 We also had a couple of worksheets about frogs & toads from Enchanted Learning that we did not cut up for the lapbook. We used the website Something Froggy for more of our science information. A frog sat on a rock. When no one was around, he would jump into the water to his secret lab! He gets his clothes on to help people because he is Super Frog! He helps an old lady find her dog. He went down into the water to get a log out of a pipe so the people will have water again, and lots of other stuff. Once again, Super Frog saves the day! She was quite proud of her story, and I'm thrilled that I got her to write something. Writing has not been a favorite around here, so I've been trying to get her to help pick what to write in the hopes that she will learn to enjoy it a bit more. I haven't figured out what literature we are doing next week. I have a few ideas, but we are not doing school on Monday. We have a field trip to the planetarium instead, so we're doing school Tu - Fri. I'm intrigued by book adventures, I'm going to have to go check it out. Visiting via The Homeschool Lounge. Have a great day!